I am putting in a small scale solar system with a 24VDC flooded lead acid battery bank for back up power. 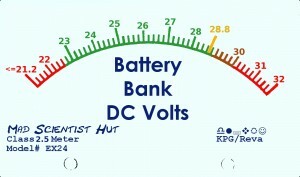 I want to make a low power consumption expanded scale analog meter circuit to monitor the battery bank voltage of my system. 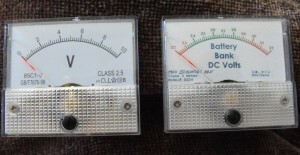 The expanded scale allows me see the voltage range that I am most concerned about between 21V to 30V and that gives me about three times the resolution on the meter face. 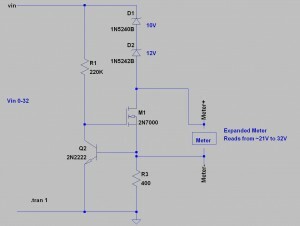 While searching for circuit ideas I found this website “The Back Shed” and I liked the simplicity of the circuit that they presented on their site (this is the circuit from their site). I tried to make the circuit but found that the response was not very linear. The problem with this circuit is that the current going through the Zener diode changes as the voltage input to the circuit changes (I=V/R) because it uses a simple resistor current limit. Zener diode voltages are specified at a set current in the datasheet. 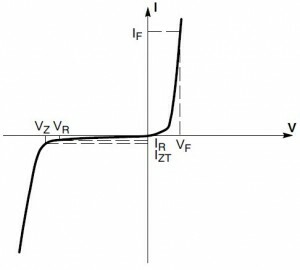 In this Zener diode curve, Izt is the current where the Zener voltage Vz is specified, if you change the current through the Zener diode the voltage changes. I wanted an expanded meter with a fairly linear response. So after thinking about the linearity issue with the Back Shed circuit and how it was related to the current changing in the circuit, I decided to revisit our old friend the current limit circuit I blogged about previously. I modified the current limit to pull about 1.5mA through the circuit and added Zener diodes in place of the LEDs. (To get a larger image, click image, then click image on the following page) So here is how this circuit works: For voltages below 21V the Zener diodes are off and there is no current flowing in the meter path of the circuit. Somewhere around 21V the Zener diodes crack over their knee voltage then current starts flowing in the circuit. 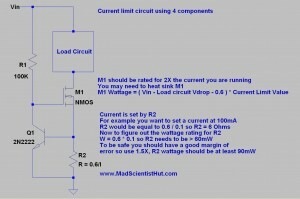 The current limit circuit turns on and starts to drop voltage across the 2N7000 NMOS FET. As the voltage going into the circuit rises the current limit circuit causes the NMOS to drop any voltage not going through the Zener and current sense resistor. 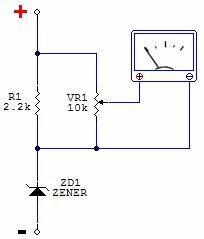 The Zener diodes drop a fairly constant voltage in this circuit because the current limit circuit is holding the current at a fairly constant rate. Since the 10VDC panel meter is measuring the Voltage across the NMOS it displays any voltage over ~21VDC on the meter face. 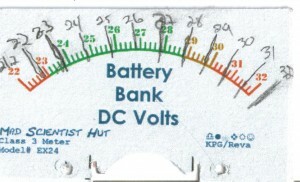 The battery bank voltage should not go over 30VDC , unless there is something wrong with the charge controller, so hopefully we never see the meter at 32V. This circuit still has the drawback of the temperature coefficient (TC) of the Zener and also the temperature effect of the VBE on the transistor that will have an over all effect on the accuracy with temperature. The temperature error is a very small (around 0.08%/degree C, for a change in room temperature of 65F to 75F you would see an error of less than 0.1V) and that small of an error really does not matter to me. If you are concerned with having a more accurate meter over a large temperature range, you can use a combination of Zener diodes with a positive and negative TC. An example would be to use four 1N5222B (TC=-0.085%/C) and a 1N5242B (TC=+0.077%/C) . After I put the circuit to the meter I found it was a little off ( this is was really no surprise, since Zener diodes are +/-5%, but it was a lot closer than I expected) so I had to calibrate the meter with one more graphic spin in GIMP. 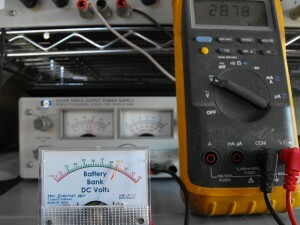 To calibrate the meter face with the actual DC voltage reading. I put the expanded scale meter in parallel with a digital multimeter, made little tick marks on the meter face for the voltages. And here is picture of the meter hooked up with a power supply and a DMM to verify operation. I need to add an active current limit to the LEDs from the previous post. The main reason for the current limit is so that the brightness of the LEDs remains uniform across the lead acid battery voltage range of 11.8 to 14.4V. 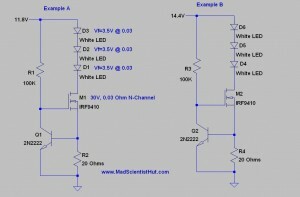 The circuit I am using is a very simple and only uses 4 components to limit current. For this example we will set the current limit at 100mA so R2 is 6 Ohms. There is one more ‘benefit’ to this circuit. If you want some limited form of over heating protection for your load circuit you can place the transistor next to the hottest part of the load. The VBE of the transistor will drop as it heats up, effectively dropping the the current limit in the circuit, this will all depend on the current in the transistor and the temperature. The greatest analog guru of all time Bob Pease wrote an article that explains VBE in detail just click here to read What’s All This VBE Stuff, Anyhow? Of course if you want to keep your current limit circuit constant keep the transistor away from the heating of the load. 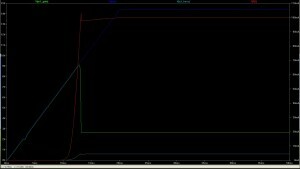 Here is a simulation run of the circuit: Red line is the current going through the LEDs and R2, Blue line is the Voltage into the circuit ramped from 0 to 14.4V in 20mS, Green is the gate voltage of the NMOS, Light blue is the Voltage across R2 and at the base of Q1. This circuit can be used for a constant current source / sink for LEDs and laser diodes (the circuit can be used on the high or low side of a load). It can also be used anywhere a current limit function is needed. The NMOS can be just about any N-Channel FET that is rated for 1.5X the voltage of the circuit, 2X the Wattage of the circuit and at least 2X the current of the circuit, and should have a reasonable RDSon. The FET may need to attached to a heat sink, if you plan on running more than a 1/4 Watt. 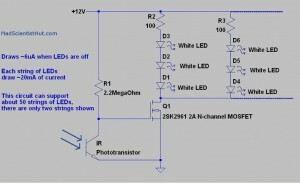 This blog adds a PWM brightness control to the circuit from the previous post A Quick and Simple LED Daylight Sensor. 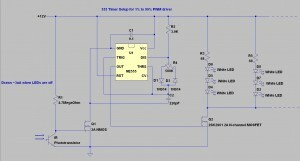 Adding a variable PWM control to the previous circuit only uses eight more components. Using the 500K potentiometer the PWM can be set for ~1% to ~99% duty cycle. I have also increased the resistance going to the photo-transistor to further reduce the off state current draw and increase the dark sensitivity ( the circuit turns on later, when it is darker, and back off earlier in the morning ). Since I am running my circuit with the PWM duty cycle set to 30% I have increased current to the LEDs to get more light out with less average current draw ( Note the 68 Ohm resistor that were 100 Ohms in the previous circuit ). The LEDS appear brighter because of persistence of vision from the human eye. When the sun is out the circuit only draws about 6uA from the battery. The 6uA draw is because the photo-transistor is conducting current from the 2.2M resistor to ground, this turns the MOSFET off since it does not have enough voltage on its gate. When the sun has gone down for the day the photo-transistor stops conducting current this turns the MOSFET on, drawing current through the LEDs to ground. 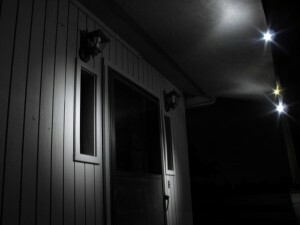 This light sensor is very sensitive to daylight, and turns on right around dusk. The sensitivity can be tweaked by changing the value of the 2.2M resistor, more resistive = more sensitive. If you increase the resistance too much the circuit will stop functioning because the leakage of the photo-transistor will pull the voltage at the gate down below the turn on threshold of the FET. The LEDs are ~10,000mcd and I am running three of them in series for each string, my circuit is running two strings of LEDs. The 100ohm resistor limits the current to the LEDs to about 20mA, so with the two strings of LEDs this circuit draws about 40mA when the LEDs are on. My circuit is powered from a 7A/Hr 12V SLA battery and is being recharged with a 1.5W solar panel. 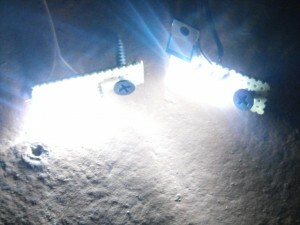 With the 40mA draw my LED solar light should run for more than 15 days without the solar charger, but with the solar charger this should run for years without any intervention. I will be checking on the battery daily for couple of weeks and will try to determine how many more strings I should be able to attach. I also plan on adding a PWM circuit to the LEDs to pulse them with a higher current. With the PWM the circuit should draw less average current with the LEDs appearing brighter due to the persistence of vision from the human eye. More on this mod in the next two weeks.